The Goldmann paperback publication of People of Darkness (1980), the fourth book in Hillerman's Navajo Mystery series and the first to introduce the character of Sergeant Jim Chee of the Navajo Tribal Police. Binding: Bright red paper covers, with white and black text. Lower half of front cover contains photograph discussed above. The back cover displays a synopsis of the novel and a brief biography of Hillerman. 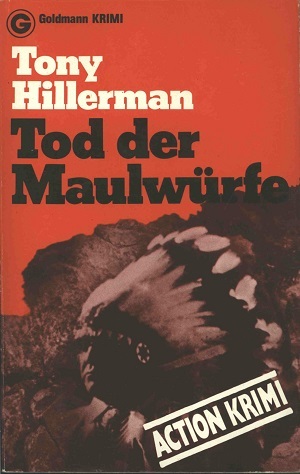 The spine is lettered: [vertical] [publisher's device] [horizontal] KRIMI/Action Tony Hillerman Tod der Maulwürfe.